Our research grants themes include our Indigenous heritage, human rights and Native Title, and archaeological heritage. UNE researchers are promoting and celebrating the contribution of those communities to the cultural heritage of all Australians. 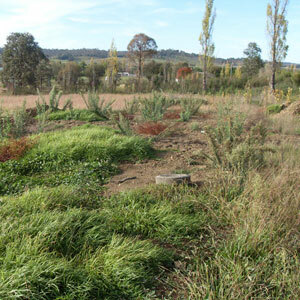 Taking up a suggestion from a local (Armidale, NSW) Aboriginal community, Dr Kate Wright is leading a project — Nourishing Culture and Developing Social Capital — that is establishing a community garden on part of a former Aboriginal reserve on the edge of Armidale. With support from several community organisations as well as the Aboriginal community itself, the garden will be a place for the inter-cultural exchange of knowledge about plants and animals, and the development of a shared environmental vision through caring for the land. While providing Kate with valuable insights into the process of fostering that communal vision, the garden will offer opportunities for all members of the Armidale community to become involved — whether as volunteers, students or 'citizen researchers'. In projects such as this, our researchers are seeking to involve as many people s possible in explorations of a shared humanity. The research of Dr Liz Ellis is addressing inter-generational loss of home-country languages within Australia's immigrant population. It is a loss of community languages that threatens to diminish the linguistic diversity and vitality of our multicultural society and can deprive children of the many advantages of a bilingual upbringing. Working with immigrant families in three regional centres, Dr Ellis, together with her UNE colleague Professor Margaret Sims, is testing the effectiveness of an innovative program aimed at helping immigrant families to foster the bilingual development of their children.